One of the highlights of my life was founding a school-link. 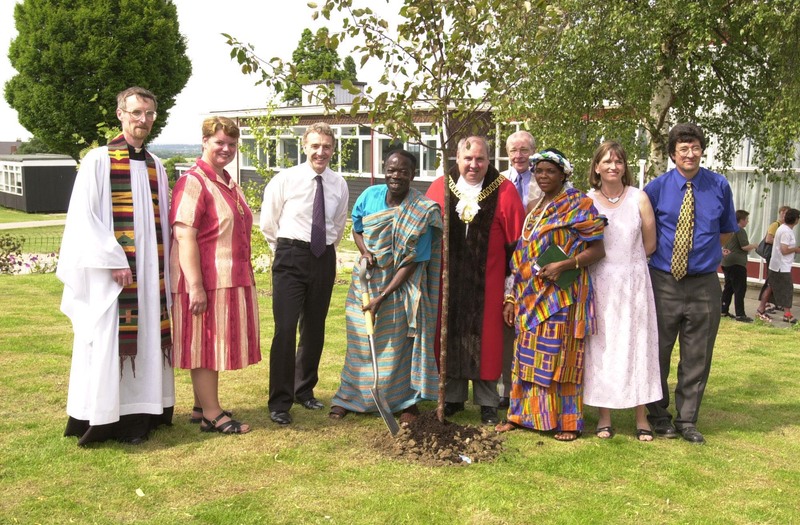 Polesworth High School.Official opening of garden by Ghanaian visitors as part of the school’s link with Pampawie junior school, Ghana,West Africa. 4/7/01. Tree Planting V.I.P line up. Back in 1999, I secured a post as a teacher of Religious Studies and History at Polesworth High School, UK. Within weeks of starting, I came across a project run by Oxfam (among others) called On The Line, seeking to link schools on the Greenwich Meridian. I checked out the various countries involved and applied seeking a school in Ghana, West Africa. From this tentative beginning a link between Polesworth High and Pampawie Junior Secondary School was forged. I had no idea that this Link would flourish, far surpassing the usual pen pal letter exchanges that so often are the sum total of school links. With the support of my Headmaster Andy Clarke, I applied to the British Council for a grant so that teachers from both schools could pay each other a visit. The basis of my grant application was a project to create two gardens, one in each school, to symbolise our Link. 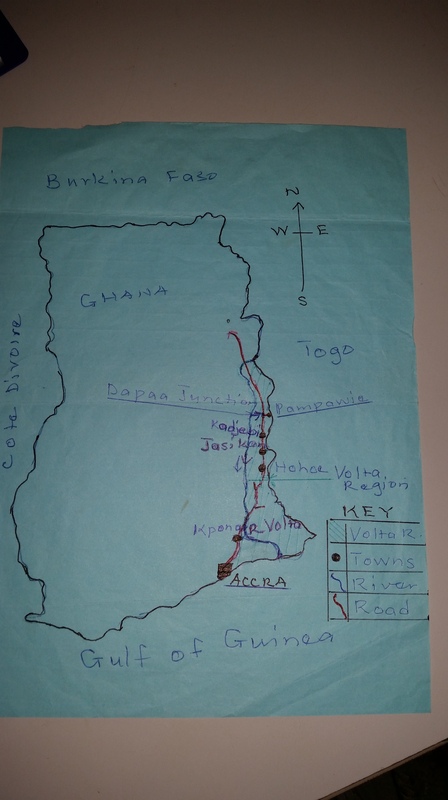 In February 2001 I went to Pampawie with a colleague, Colin Kinder, following the mud map supplied on a sheet of blue air mail paper sent by the Principal, Peter Adjandjah. It was a transformative experience. The hospitality, the aspiration, the enthusiasm was overwhelming. Students who were learning to count using pebbles, and to write using sticks in the sand, suddenly had before them a chance of a better future. Yet the Link was never about charity. It was about raising awareness and fostering friendships, about sharing and learning from each other. Here is a video of the trip. I left Polesworth High in 2002, leaving the Link and Pampawie behind to return to Australia. My successor, teacher Sharon Leftwich Lloyd, continues to this day in her role as Link coordinator to ensure the Link flourishes. Student exchanges, collaborative projects across the curriculum have seen Polesworth rise to the prestigious status of International School. Last I heard Sharon was giving an address to the House of Lords. And I’m told that in the school garden in Pampawie, there is a plaque that bears my name. I was Isobel Schofield then. Sunlight belted down on my hat through a dusty, smoke haze. It was February 2001 and the Harmattan, a seasonal wind blowing Saharan dust into the tropical rain forests of West Africa’s coastal fringe, had come early again. Heading towards the school we walked along the main street of Pampawie, passing a ribbon of mud-brick dwellings with no telecommunications and an unreliable electricity supply. Here and there a shady tree rose out of the parched earth. Deep dish drains flanked the street. Women in brightly coloured dresses and headscarves gathered near the communal kitchens in the market square. On their way back from the one village pump, four girls balancing bowls of water on their heads walked by. Old men sat under corrugated-iron verandahs. There were no cars. Chickens scratched about. Dogs lay in the shade. A teacher appeared. We kissed and walked on. I am no hero, but I guess I did something heroic. I’m no visionary, but I did have a vision. I was six weeks into my first teaching post, Religious Studies, when I came across a pamphlet advertising On The Line, an Oxfam and Channel 4 linking project to link schools on the Greenwich Meridian. The inner activist in me sparked. At first an impulse but in moments my entire being was alive with the potential. This was exactly for me. I was cautioned that I would be taking on too much too soon, but I didn’t listen. I knew this was within my reach. I applied, anticipating, after following the criteria, that we would be matched with a school on the outskirts of a Ghanaian city or large town. 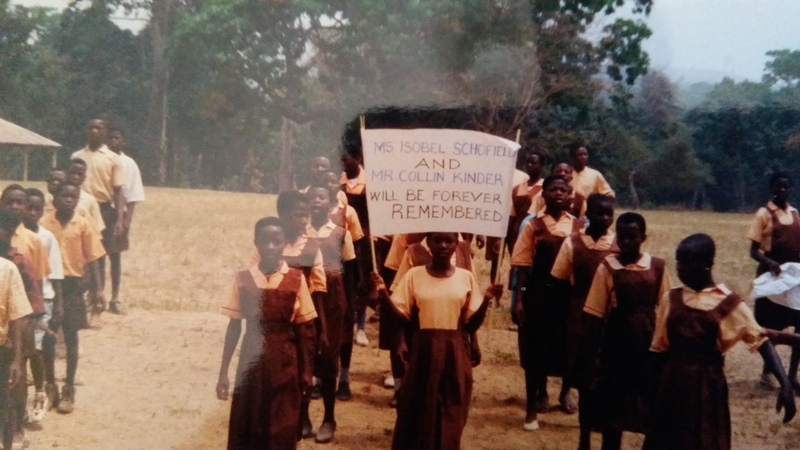 Weeks later our semi-rural school of white kids, was officially linked with a remote village far up the tongue of land between the River Volta and the Togoan border in Ghana’s mid-northeast. Undeterred, I wrote to the headmaster who admitted to me later that at first he thought the link was a nonsense and nothing would come of it. Nevertheless, he wrote back. We started a pen pal group. A whole year passed. I persisted. The Link took off when we secured a British 2 Council teacher-exchange grant. We were to create a garden in each school to commemorate our Link. With the now enthusiastic support of the headteacher, I ran a working group. I attended a UKWOLA conference and returned knowing exactly what I wanted to achieve. I wrote a draft of aims and objectives to take to Ghana based around friendship, cultural awareness and human betterment. We would devise joint curriculum projects and conduct student exchanges. 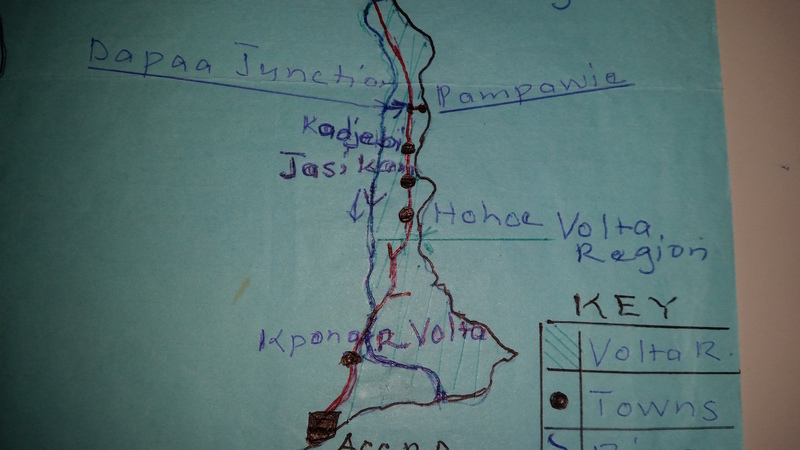 And together with a colleague I followed Peter’s mud map, sketched on blue airmail paper, to Pampawie. That week we met teachers, students, the village Chief and Elders, and local executives; we observed lessons; attended a dance drama performed by students; visited a nearby fish farm and attended a Durbar held in our honour and made plans for the gardens. We had agreed our aims and objectives. Now I felt swallowed whole by Ghana. When we returned, the Link gained momentum. Looking back this was the most fulfilling experience of my life. From selling Dubble Bars (fairly-traded and made with Ghanaian cocoa) in a pre-Easter awareness and fund-raising effort to arranging an event-packed fortnight for visiting teachers and dispatching to Pampawie computer and printing equipment, a satellite phone, science equipment and much needed exercise books. This is when I left to re-join my family in Australia. I’d burnt out and now, leaving meant leaving the link. It was a visceral wrench. I felt like a mother abandoning her new-born baby. I went on to build a bed and breakfast and extensive gardens with my then husband which was to be a model of self-sufficiency and ethical living. For all the abundance and the exclamations of our guests, it still didn’t come close to the Link. 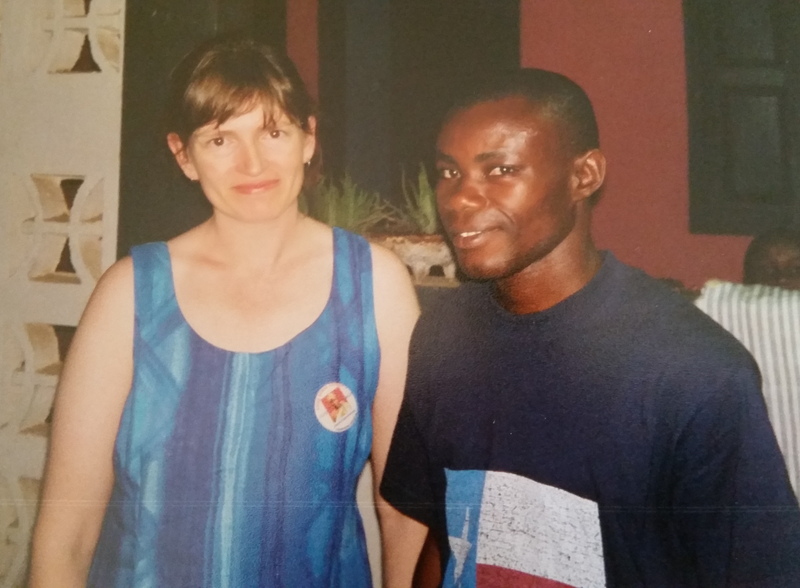 I remain as passionate as ever, campaigning for the rights of refugees and asylum seekers in Australia in the face of ignorance and harsh attitudes, campaigning that brings me right back to my classroom. Back to the Ghana Link as the single most valuable way to open people’s eyes and touch their lives for the better. 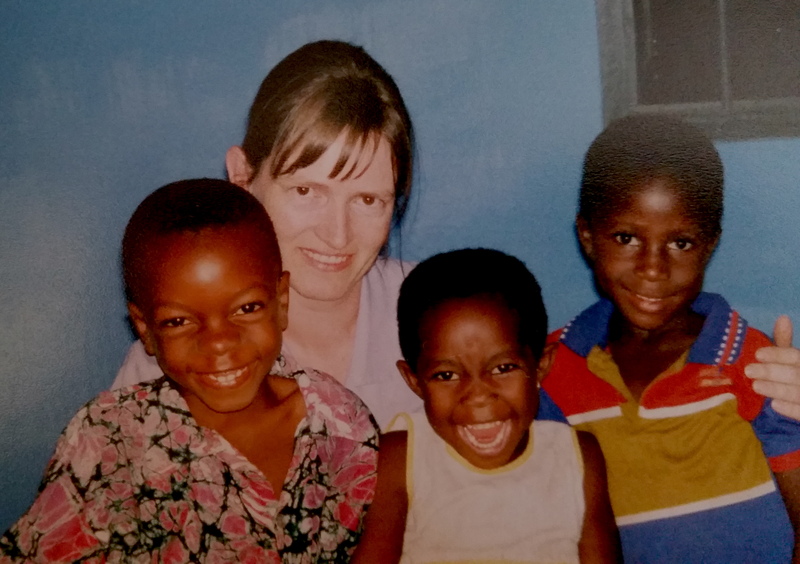 I had no idea when I flew away back in 2002 that I’d started something that would endure for over a decade, touching thousands upon thousands of lives. I knew my successor had the youth and the vitality to take the Link to its potential heights. She could do it. She has. There is a plaque in the Pampawie Garden with my name on it. I haven’t seen it. I’ve still got the press cuttings, letters, photos and a five-thousand Cedi note. And Peter’s mud map. Perhaps one day I’ll use his map again and find my way to Pampawie.